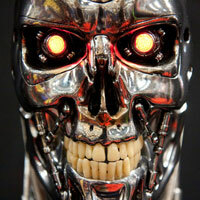 (Nanowerk News) Fear of machines becoming smarter than humans is a standard part of popular culture. In films like iRobot and Terminator, humans are usurped. Throughout history we can trace stories about humankind overreaching through a desire to understand and copy ourselves, from Ancient Greek mythology to Milton’s Paradise Lost and Shelley’s Frankenstein. Today’s Prometheans are supposedly scientists working on artificial intelligence (AI), who run the risk of creating machines intelligent enough to supercede us. Terminate your concerns But this is no mere convention of dystopian science fiction, worries such as these are expressed by academics too. A recent review by Luke Muehlhauser, Executive Director of the Machine Intelligence Research Institute, suggests that “the default outcome from advanced AI is human extinction” ("Intelligence Explosion: Evidence and Import"; pdf). If this is true, we definitely have cause for concern. Muehlhauser and others are worried we will reach a point in the future where AI will surpass human intelligence – a moment often referred to as the “singularity”. Once the singularity is reached, so-called “runaway AI” might continue to improve itself at an accelerating rate, leaving human intelligence far behind. The most plausible scenario is that our collective intelligence will continue its runaway path. Greater and deeper integration between humans and our intelligence enhancing technologies will result in an increasingly bio-hybrid – part biological, part artificial – form. What is good for AI will then also be good for us.